Over 8 Million Copies of the Book Sold in the U.S. 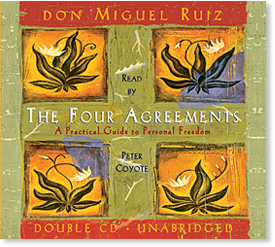 In this powerful, unabridged reading of The Four Agreements, actor Peter Coyote gives voice to the writings of don Miguel Ruiz. According to Ruiz, everything we do is based on agreements we have made — agreements with ourselves, with other people, with God, with life. But the most important agreements are the ones we make with ourselves. In these agreements we tell ourselves who we are, how to behave, what is possible, what is impossible. One single agreement is not such a problem, but we have many agreements that come from fear, deplete our energy, and diminish our self-worth. In The Four Agreements, don Miguel reveals the source of self-limiting agreements that rob us of joy and create needless suffering. When we are ready to change these agreements, there are four deceptively simple, yet powerful agreements that we can adopt as guiding principles. Based on ancient Toltec wisdom, The Four Agreements offer a powerful code of conduct that can rapidly transform our lives to a new experience of freedom, true happiness, and love. BE IMPECCABLE WITH YOUR WORD. Speak with integrity. Say only what you mean. Avoid using the word to speak against yourself or to gossip about others. Use the power of your word in the direction of truth and love. DON’T MAKE ASSUMPTIONS. Find the courage to ask questions and to express what you really want. Communicate with others as clearly as you can to avoid misunderstandings, sadness, and drama. With just this one agreement, you can completely transform your life. ALWAYS DO YOUR BEST. Your best is going to change from moment to moment; it will be different when you are healthy as opposed to sick. Under any circumstance, simply do your best, and you will avoid self-judgment, self-abuse, and regret. The Four Agreements sound simple, even simplistic. But try keeping just one for an entire day! One single agreement is not such a problem, but we have many agreements that make us suffer, that make us fail in life. If you want to live a life of joy and fulfillment, you have to find the courage to break those agreements that are fear based and claim your personal power. The agreements that come from fear require us to expend a lot of energy, but the agreements that come from love help us to conserve energy and even gain extra energy. Each of us is born with a certain amount of personal power that we rebuild every day after we rest. Unfortunately, we spend all our personal power first to create all these agreements and then to keep these agreements. Our personal power is dissipated by all the agreements we have created, and the result is that we feel powerless. We have just enough power to survive each day, because most of it is used to keep the agreements that trap us in the dream of the planet. How can we change the entire dream of our life when we have no power to change even the smallest agreement? If we can see it is our agreements which rule our life, and we don’t like the dream of our life, we need to change the agreements. When we are finally ready to change our agreements, there are four very powerful agreements that will help us break those agreements that come from fear and deplete our energy. Each time you break an agreement, all the power you used to create it returns to you. If you adopt these four new agreements, they will create enough personal power for you to change the entire system of your old agreements. You need a very strong will in order to adopt the Four Agreements — but if you can begin to live your life with these agreements, the transformation in your life will be amazing. You will see the drama of hell disappear right before your very eyes. Instead of living in a dream of hell, you will be creating a new dream — your personal dream of heaven. The first agreement is the most important one and also the most difficult one to honor. It is so important that with just this first agreement you will be able to transcend to the level of existence I call heaven on earth. The first agreement is to be impeccable with your word. It sounds very simple, but it is very, very powerful. Why your word? Your word is the power that you have to create. Your word is the gift that comes directly from God. The Gospel of John in the Bible, speaking of the creation of the universe, says, “In the beginning there was the word, and the word was with God, and the word is God.” Through the word you express your creative power. It is through the word that you manifest everything. Regardless of what language you speak, your intent manifests through the word. What you dream, what you feel, and what you really are, will all be manifested through the word. The word is not just a sound or a written symbol. The word is a force; it is the power you have to express and communicate, to think, and thereby to create the events in your life. You can speak. What other animal on the planet can speak? The word is the most powerful tool you have as a human; it is the tool of magic. But like a sword with two edges, your word can create the most beautiful dream, or your word can destroy everything around you. One edge is the misuse of the word, which creates a living hell. The other edge is the impeccability of the word, which will only create beauty, love, and heaven on earth. Depending upon how it is used, the word can set you free, or it can enslave you even more than you know. All the magic you possess is based on your word. Your word is pure magic, and misuse of your word is black magic. The word is so powerful that one word can change a life or destroy the lives of millions of people. Some years ago one man in Germany, by the use of the word, manipulated a whole country of the most intelligent people. He led them into a world war with just the power of his word. He convinced others to commit the most atrocious acts of violence. He activated people’s fear with the word, and like a big explosion, there was killing and war all around the world. All over the world humans destroyed other humans because they were afraid of each other. Hitler’s word, based on fear-generated beliefs and agreements, will be remembered for centuries. The human mind is like a fertile ground where seeds are continually being planted. The seeds are opinions, ideas, and concepts. You plant a seed, a thought, and it grows. The word is like a seed, and the human mind is so fertile! The only problem is that too often it is fertile for the seeds of fear. Every human mind is fertile, but only for those kinds of seeds it is prepared for. What is important is to see which kind of seeds our mind is fertile for, and to prepare it to receive the seeds of love.